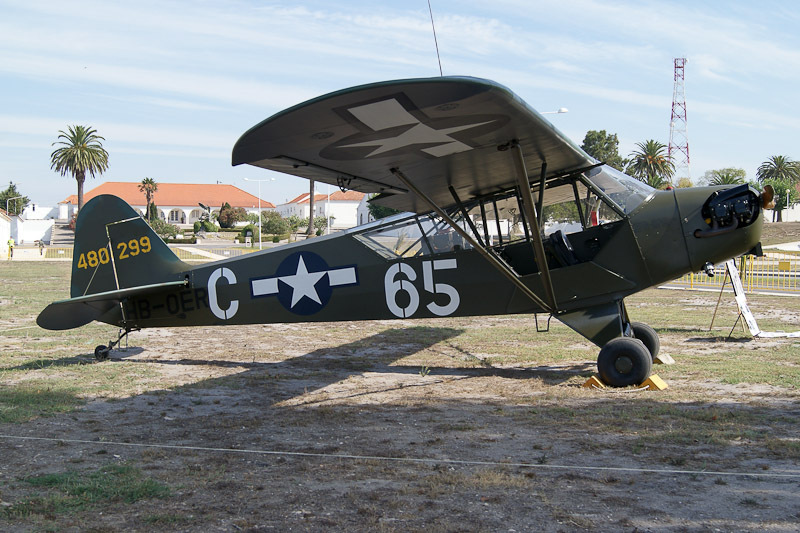 The Piper L-4J Cub is a two-seat single engine high wing light aircraft used by the military as an air observation post. Piper Aircraft Corporation built 14,125 civil Cubs between 1938 and 1947, and 5,673 for the military between 1942 and 1945. Their military nickname was "Grasshopper". Piper J3-C-65/L-4J-PI Cub HB-OER flew first in 1944 as AF# 44-80299. The 44-80299 entered service with the USAAF during WWII. Today, the Cub is registered HB-OER in Switzerland and operated in Portugal. The Cub was photographed at Base Aérea nº1 Sintra in Portugal during Aeronostalgia 2010.